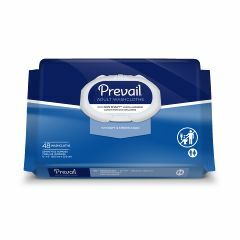 Disposable washcloths and baby wipes are the mainstay of any incontinence program. Disposable wipes provide a convenient and sanitary way of maintaining good hygiene. Most wipes are specially formulated to sanitize the skin while simultaneously protecting the skin from moisture and dryness. Disposable wipes eliminate the need for a 2 part bathing process which typically requires both washing and rinsing. Don't run out of incontinence wipes or washcloths. Sign up for AllegroMedical.com's Monthly Delivery program and have your wipes delivered monthly, or as often as you need them. Dry Washcloths - Disposable, 12" x 10"
TENA Cliniguard Disposable Washcloths (Dry Wipes) 10" x 13.25"